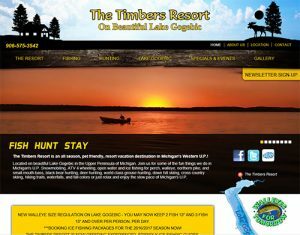 NuTerra LLC is proud to announce that we have just completed projects for The Timbers Resort and Eyes-Guy Guide Service. Owners Tim and Sarah Long were looking for a new fresh mobile responsive approach to both of their websites. They were open to our help with corporate branding to create a new logo for Tims’ Eyes-Guy site and to incorporate new ways to reach their customers by integrating both SEO techniques and Facebook feeds/social media into both of their sites. We happily went to work creating sites that they could feel confident would get their message out. It was important to us from our veteran experience in working with both guides and resorts to make it easier than ever for their clients to book both guide trips or make reservations for their resort. In addition to easy to fill out forms on both sites, we also added an option to sign up for seasonal newsletters for events and announcements. It was also a priority to create sites that would capture and embrace the various seasons and experiences that visitors can expect to have. Our team is looking forward to following the positive growth and results that we are confident will happen as a direct result of our excellent partnership and work with Tim and Sarah. 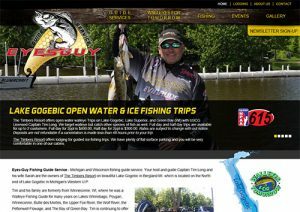 It is our sincere hope that these new sites will give their visitors searching for that outdoor experience- a sense of joy, excitement and a glimpse of what great experiences are instore for them on legendary Lake Gogebic.